LANXESS’ Liquid Purification Technologies business unit—operating in the United States as LANXESS Sybron Chemicals—will showcase its expanded portfolio of water purification membranes, including the exciting new HP and UF lines, at Booth #609 of the upcoming 2019 Membrane Technology Conference & Exposition, February 26 – 28 in New Orleans. MTC 2019 will be the first opportunity for the industry to see first-hand LANXESS’ just-released HP (high performance) reverse osmosis (RO) membranes. Lewabrane RO B400 HP and Lewabrane RO B440 HP elements include enhanced brackish water processing capabilities to serve applications in which high rejection and energy efficiency are important. Using the new types in combination with monodisperse Lewatit ion exchange resins provides high quality produced water at lower operational cost. With an average salt rejection of 99.7% (at 2,000 ppm NaCl; 15.5 bar/225 psi) and high permeability, Lewabrane HP membranes are a further development of the high cross-linked polyamide membrane which LANXESS launched in 2012. Controlling the degree of polyamide cross-linking during production process provides a small effective “pore size” that results in high rejection of solutes, regardless of their charge. “By optimization of the process, the flux could be improved without compromising permeate quality. Therefore, high rejection, even at changing feed parameters like pH or salinity, can be achieved at high flux rate,” explains Dr. Jens Lipnizki, head of Technical Marketing Membranes in the Liquid Purification Technologies business unit. 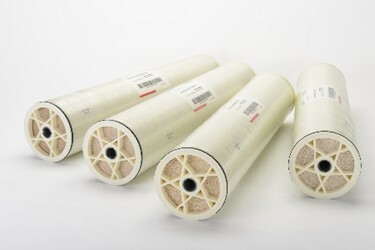 The Lewabrane reverse osmosis (RO) membrane elements product line, including the recently introduced Ultra Low Pressure line, is characterized by high water permeability resulting in low power consumption and low cost operation. These Lewabrane elements are also used for removal of CEC’s (contaminants of emerging concern) and for removal of micro-pollutants in potable water supplies. The RO membrane chemistry and element construction is designed to provide optimized, low-cost operation for downstream unit applications including separate-bed or mixed-bed ion exchange units. LANXESS’ booth at MTC will also feature a prominent display of ultrafiltration (UF) membranes. It was only last year that LANXESS added ultrafiltration to its range of water-treatment technologies through an agreement with the French company Polymem SA. The innovative Gigamem UF modules reduce the operational costs and the footprint of the plant, which can be a limiting factor using UF. Additionally, the permanent hydrophilic Neophil membrane material lowers the fouling tendency and ensures a stable filtration process. The Gigamem concept features a housing that is permanently fixed in place and which uses exchangeable membrane cartridges. If a fiber is damaged, the user can decide to fix the hollow fiber or to exchange the individual cartridge. This makes maintenance very easy to perform and the process very reli­able. The filtration process itself operates outside/in, delivering a high tolerance of suspended solids. Configurations are feasible for different regeneration processes, such as backflush or air scouring. LANXESS continues to enhance its LewaPlus software, which is a free, comprehensive platform for designing water treatment systems with ion exchange resin (IX) and reverse osmosis (RO) membrane systems, by adding a CCRO design module (closed circuit reverse osmosis). The current LewaPlus version 2.0.9 software has a high degree of design flexibility, giving users the ability to drag and drop different technologies in one design, and showing all selected modules in a combined PDF report. In addition, LewaPlus 2.0.9 offers users an intuitive cross reference tool to identify which Lewatit and Lewabrane products they can use to replace conventional elements when upgrading their plants. The LewaPlus CCRO module helps RO system designers evaluate high recovery RO processes, often used for ZLD (zero liquid discharge) or MLD (minimal liquid discharge) treatment processes. The CCRO process enables increased RO system recovery of up to 98% (vs. 75 to 85% for conventional RO process), lower power consumption per unit of permeate water, improved scaling control and simplified design and operation.